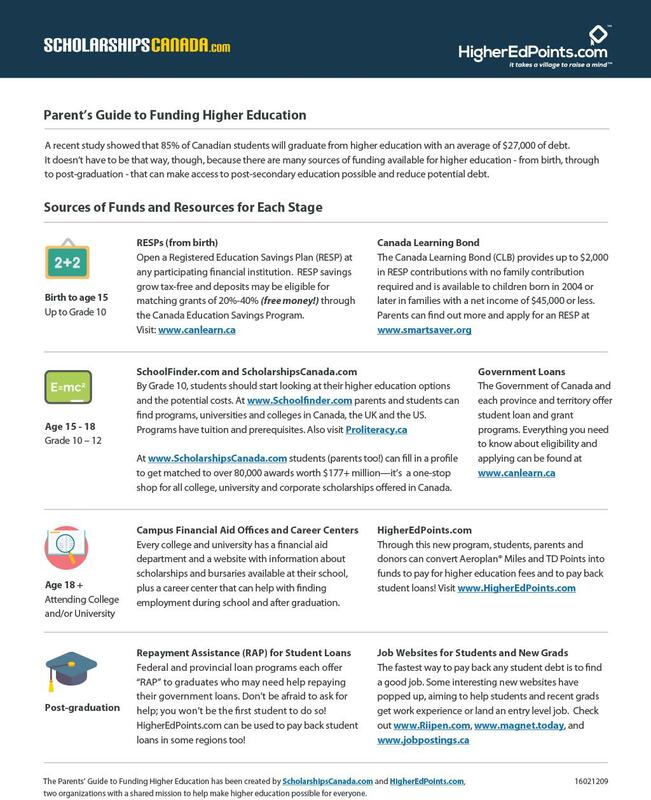 We are pleased to have collaborated with ScholarshipsCanada.com and SmartSaver to create a new Birth-to-Graduation guide to funding higher education. The Parent’s Guide to Funding Higher Education provides an overview of major sources of funding at each stage of a child’s life–from birth (RESPs, Canada Learning Bond) through the exploration and decision years in high school (scholarships, student loans) during study at college or university (entrance awards, bursaries and HigherEdPoints.com) through to graduation (jobs, loan repayment assistance and HigherEdPoints.com). Please feel free to download, print and/or distribute the guide (attached to this post) as you wish–this information will help students, grads and their families find the funding needed to pursue a higher education.